The State of Arizona has announced that Apple will build a manufacturing facility in Mesa which will be used for the production of sapphire material. 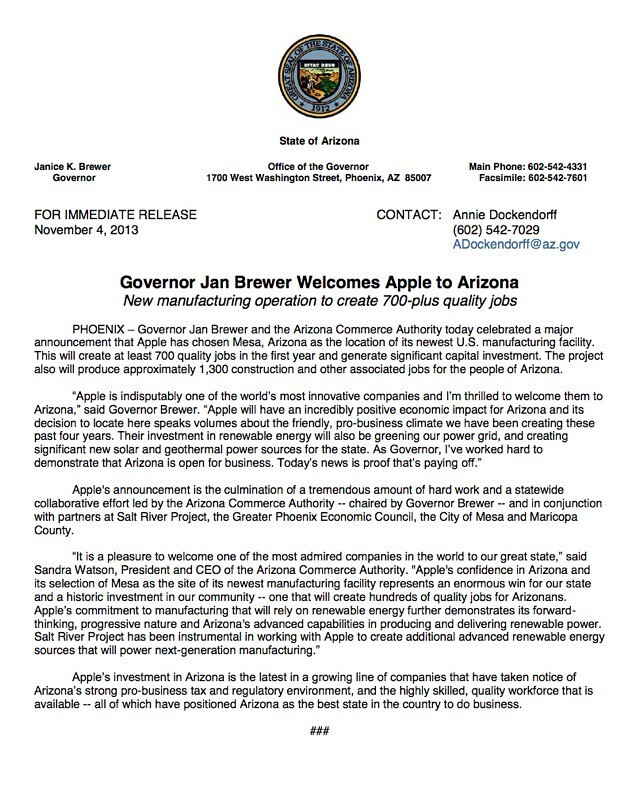 Governor Jan Brewer and the Arizona Commerce Authority today celebrated a major announcement that Apple has chosen Mesa, Arizona as the location of its newest U.S. manufacturing facility. This will create at least 700 quality jobs in the first year and generate significant capital investment. The project also will produce approximately 1,300 construction and other associated jobs for the people of Arizona. Although the State of Arizona release didn't reveal the purpose of the Apple facility. GT Advanced Technologies today announced that it has entered into a multi-year supply agreement with Apple Inc. to provide sapphire material. GT will own and operate ASF furnaces and related equipment to produce the material at an Apple facility in Arizona where GT expects to employ over 700 people. Apple will provide GT with a prepayment of approximately $578 million. GT will reimburse Apple for the prepayment over five years, starting in 2015. Although the agreement does not guarantee volumes, it does require GT to maintain a minimum level of capacity. GT will be subject to certain exclusivity terms during the duration of the agreement. GT expects this arrangement to be cash positive and accretive to earnings starting in 2014. Gross margins from this new materials business are expected to be substantially lower than GT's historical equipment margins. However, the company believes the strategic nature of this agreement and the benefits associated with building a recurring revenue stream are important to its continued diversification.